Our small Chapter can boast that two of its members have received the Lewis and Clark Trail Heritage Foundation’s Distinguished Service Award. Those two members presented with the awards are Hal Price and our Chapter’s President, Rose Oleson. Dr. Ambrose talked to us about the historic sites along the Lewis and Clark trail and encouraged us to be prepared for the invasion of interested people when the Bi-Centennial of the Expedition approaches. Being a very knowledgeable Lewis and Clark historian, Hal knew of the crimson bluff that Capt. Lewis mentioned in his journal on 24 July1805. He also knew of other features along the trail and the group of islands between Townsend and Toston that Capt. Clark named for his black servant, York. Because of Hal’s love of history and in particular, the Corps of Discovery, he invited his special friends and Lewis and Clark enthusiasts, Troy Helmick and John Stoner, over for coffee and a lengthy discussion of how best to inform the public about the Lewis and Clark sites in the Townsend area while protecting and preserving the sites. At Hal’s direction, the Townsend citizens formed the Crimson Bluffs Chapter and on July 24, 1998 the chapter was designated an official chapter of the Lewis and Clark Trail Heritage Foundation. With Hal’s guidance, the chapter members applied to the United States Board on Geographic Names to officially name the group of islands “Yorks Islands,” as Clark intended. The application was approved and interpretive signs are now in place. When it became evident that the Crimson Bluffs were in danger of destruction by the rapidly advancing subdivision, Hal again led the effort to protect the site and the property was purchased and is now in public ownership. Yorks Islands and the Crimson Bluffs are two of only a few Lewis and Clark historic sites that can be documented and located in much the same condition that members of the Expedition saw them 200 years ago. 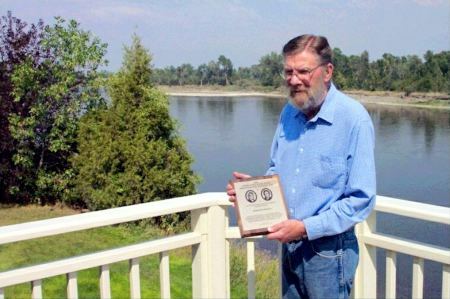 It is because of Hal Price that the link for historians and visitors is provided in retracing the footsteps of the Corps of Discovery, and the Crimson Bluffs Chapter would like to recognize him with the Distinguished Service Award. 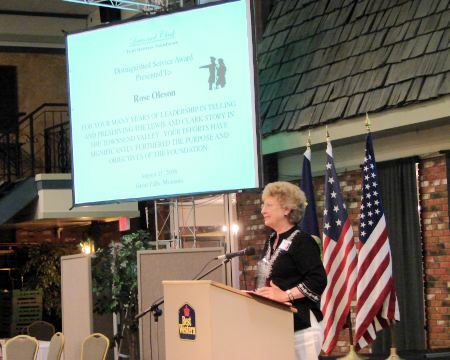 The Lewis and Clark Trail Heritage Foundation has honored Rose Oleson of Townsend, Mont., with its 2008 Distinguished Service Award. Oleson is a founding member of the Foundation’s Crimson Bluffs Chapter in Townsend. She has served as the chapter president for 10 years, and in that time, has enthusiastically led the Crimson Bluffs Chapter to “tell the story and steward the trail” along the Upper Missouri River in the Townsend Valley. Oleson led the chapter’s efforts to identify Yorks Islands and to ensure the islands’ place on maps. She also directed the chapter’s efforts to identify the Crimson Bluffs and to protect and preserve them for future generations. During the Lewis and Clark Bicentennial years, she helped the chapter set the standard for programs, hospitality and community outreach in the Crimson Bluffs area. The family-oriented events brought the story to hundreds of would-be explorers, children and educators. Under Oleson’s leadership, the chapter created a 17-point self-guided auto tour. Members carefully researched the Lewis and Clark Expedition’s route through the Townsend Valley, and developed 17 interpretive markers and a colorful informative brochure. Over many years, Oleson has led the Crimson Bluffs Chapter’s efforts to serve as keepers of the story and stewards of the trail in the Townsend Valley. This award is presented annually to a Foundation member who has made an outstanding contribution toward furthering the purpose and objectives of the Foundation. Ten years ago, the Crimson Bluffs Chapter of the LCTHF was organized in a little Montana town, Townsend. It certainly was (and is) one of the smallest of the 40+ chapters of the entire country. But…what a chapter! I had the opportunity to speak at a number of their events– whether a chapter meeting, new signage gathering, dedication of the Yorks Islands, location of the Crimson Bluffs. And, at the forefront over and over again, Rose Oleson. What a fine leader: enthusiastic, thoughtful, diligent, always making everyone feel empowered and important. Rose has been an absolute breath of fresh air for the chapter. I personally commend her because she represents the best of this outstanding chapter and of the Lewis and Clark Trail Heritage Foundation. I have witnessed and participated in the efforts to have the Lewis & Clark story imprint firmly planted in the area with all –school assemblies, classroom projects, great signage, a marvelous brochure of the area, boat launch and park site, recognition of the breathtaking bluffs and the magical Yorks Islands. York–long deserving of more recognition–and where does he get it in spades? Near Townsend, Montana. And, who leads the campaign? Rose Oleson. As a former board member and long-time LCTHF enthusiast, I have been lucky enough to see the best efforts–nationally and locally. She is a most deserving Distinguished Service Award Winner.